LONDON, ENGLAND - NOVEMBER 11: Henrikh Mkhitaryan of Arsenal passes the ball under pressure from Matt Doherty of Wolverhampton Wanderers during the Premier League match between Arsenal FC and Wolverhampton Wanderers at Emirates Stadium on November 11, 2018 in London, United Kingdom. (Photo by Shaun Botterill/Getty Images),             c  x                                            null. Arsenal fail to win but maintain their unbeaten run with 1-1 draw against Wolverhampton Wanderers. 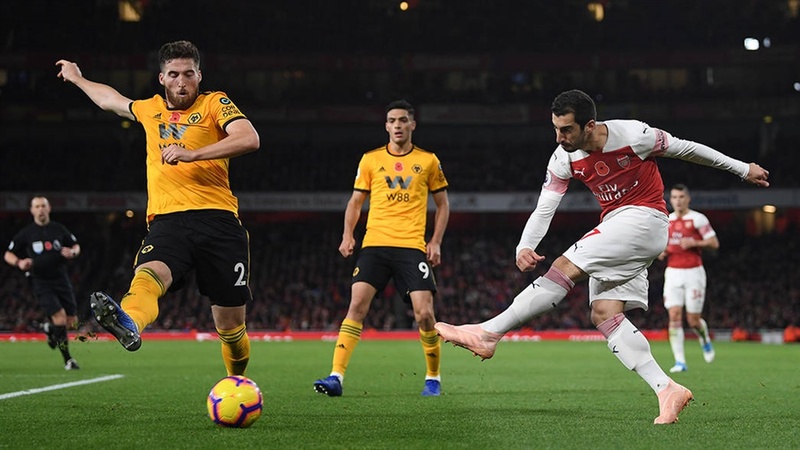 A late equaliser from substitute Henrikh Mkhitaryan spared Arsenal’s blushes in a 1-1 draw against a well-organised and creative Wolverhampton Wanderers in the English Premier League at the Emirates on Sunday. The visitors had been minutes away from their first victory over the Londoners since 1979 after taking the lead in the 13th minute through Ivan Cavaleiro. The Portuguese forward intercepted a clumsy back pass from Arsenal’s Granit Xhaka. He ran forward to play a quick one-two with Raul Jimenez on the edge of the area before slotting the ball in at the corner for his second goal of 2018/2019. Arsenal pushed forward in search of an equaliser but left themselves open much of the time, leading to numerous chances at both ends throughout the match. Mkhitaryan finally managed to maintain the Gunners’ unbeaten run — 16 games in all competitions — in the 86th minute. He floated a shot in from long range to the bottom right corner past Wolves goalkeeper Rui Patricio. Wolves substitute Adama Traore very nearly won the match for the visitors in extra time, racing onto a long pass and outstripping defender Rob Holding with his pace. But he was only able to fire his shot into Arsenal goalkeeper Bernd Leno’s chest. The result leaves Arsenal fifth in the league and three points behind north London rivals Tottenham Hotspur, while Wolves stayed 11th.